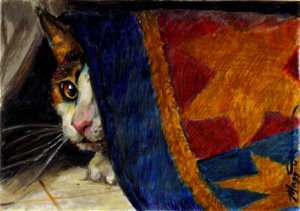 "Cat in a Rug" - 2.5 x 3.5"
I don't think people realize how difficult it is to get an appropriately catty pose without it bordering upon the ridiculous. Today, for instance, Moose (my cat) got his head stuck in my tennis shoe, chasing a dog kibble that he'd put in there. Engaging, yes. Memorable, yes. But fine art? Hardly. Likewise, a few days ago I found him sitting placidly in the bowl of my toilet, studying the drain as if waiting for it to flush him away. Interesting, yes. Cattish, yes. The stuff of art cards? I think not. So having Moose as a muse has its distinct trials. Though he does run eagerly to me if he sees the camera ("time to work! my public awaits! "), some days he would rather climb the blinds and thumb his feline nostril parts at my attempts to catch him in an endearing position. Anyway, today you can see that he was rolling around in our entryway rug, oblivious to how idiotic he looked. Wait . . . how is that different from his normal behavior? By this point, it takes me about five minutes to locate the remote phone when it rings. Oh, how silly of me. It was nestled beneath my cadmium orange paint jug. What's worse is when my husband Ed sets an important piece of paper somewhere on the desk at the beginning of the week. And then expects to come back and get it at the end of the week. Ha! Double ha! What's he think this desk is for anyway? Not paperwork, surely. Beautiful piece of work - and fun to read your internal artistic process. Beautiful! You have so captured the moment and the feelings of the cat just exude from this piece. Wonderful! Great colors! Thanks for letting us see your quite orderly desktop Maggie. I was just about to do a post on my nightmare of a work area. Thanks for stopping by. I just saw you other gorgeous cat in ART CALENDAR! HI Maggie! What a great painting, glad to see you were here! 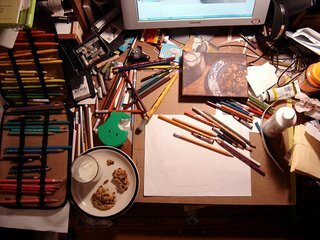 I have to say that I at least put my pencils away. You can now see that the top of the desk was once wood colored, bemeath the pastel dust.